The Clapper Rail are my entry for this weeks Camera Critters click on my link to see more critters. My skywatch post now follows my Clapper Rail. 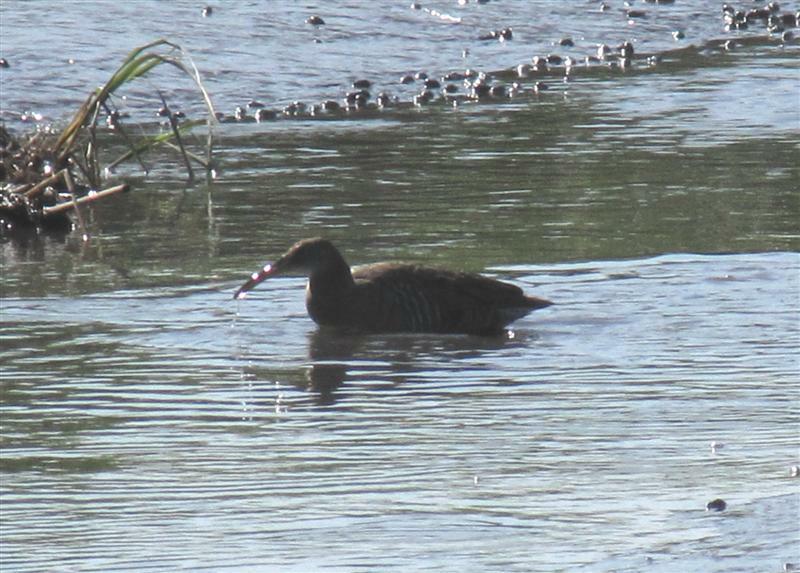 One of the most exciting birds and the best bird I saw last weekend in Delaware was the Clapper Rail. 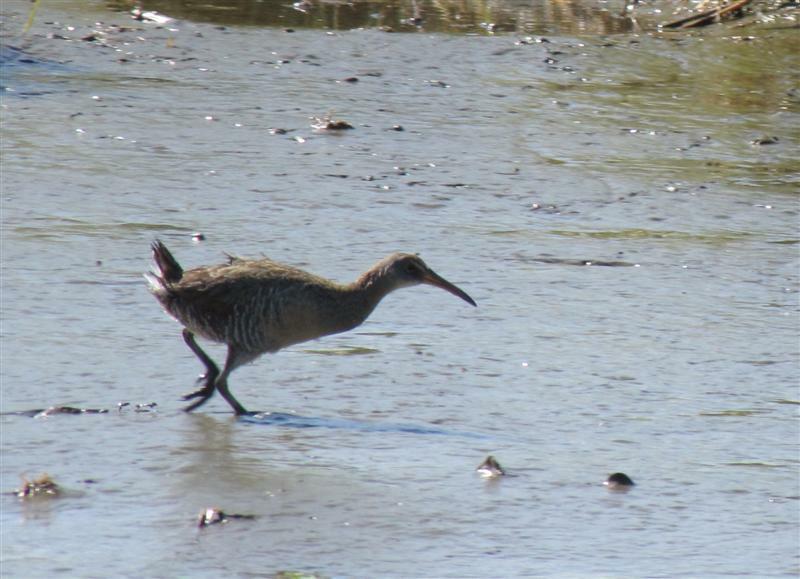 My birding friends and I were headed to the shore when we heard these Clapper Rails. I have always wanted to see a Rail and up till now I was only able to hear them. 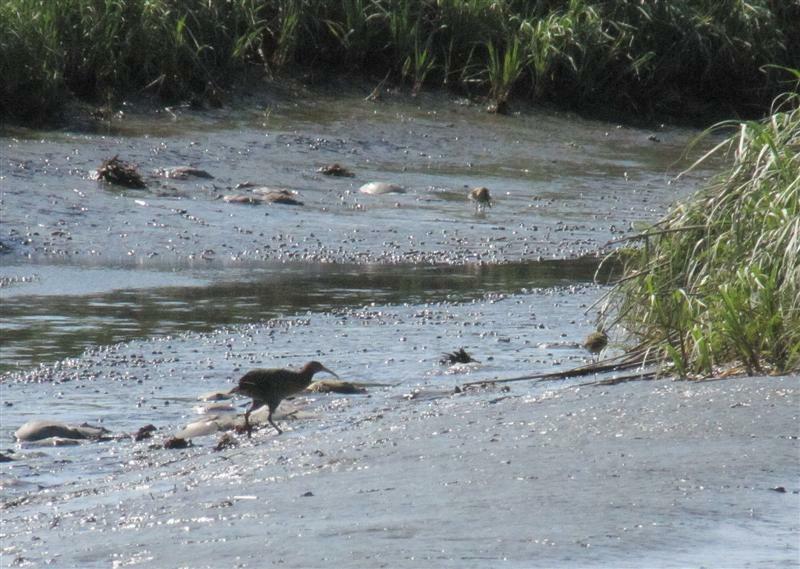 They are not the best photos but, they show the Clapper Rail's size, bill, the habitat where they find their food and water. They are very shy birds and like to hide in tall grasses. I read online that the populations are down in the USA due to the destruction and loss of coastal marshland. The Clapper Rail is a chicken size bird that rarely flies, it is graysih brown with a chestnut breast. They eat crustaceans, insects and small fish. They search for food while walking, sticking the bill into the water or mud. It was a cool experience for me to see this bird out in the open. This is my post for Friday Ark and to see more animals on the Ark just click on my link. Also my entry for Michelle's Nature Notes click and visit to see more nature post. Thanks for stopping by my blog, I appreciate your visit. You captured them in motion so well. I'm not familiar with these although I'm pretty sure I've seen them on the coast. Interesting post. do not stop, but run! Sometimes we take whatever picture we can.These are good,especially given the secretive nature of these birds. I always see a similar one along my jogging trail nearby a river, but I never hold any camera during jogging. 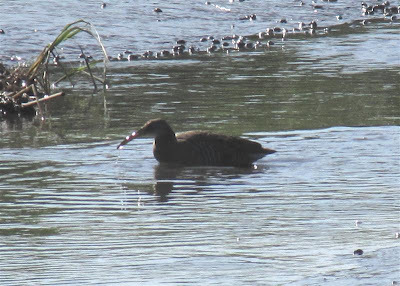 Good pics of the Clapper Rail, Eileen. What a great bird! Your photos really capture it - running and ... swimming? I never knew they swam; always thought of them running & hiding. Thanks for enlightening me. These are good action shots and great info. This is a new bird to me and it has such an unusual name! Your photos are great! Especially find the shape and length of this bird's beak is quite intriguing! Once again beautiful photos with such an interesting lesson on the Clapper Rail - I'm not sure if they are in my area but I am going to keep my eyes opened for them. I've never even heard of a Clapper Rail so this was especially interesting for me...you've done a wonderful job of capturing it's personality! Congratulations on the great capture. How fun to set a goal like that and finally reach it. Now thanks to you, we've all learned what Clapper Rails look like--- AND that they exist! I've never heard of this bird either! What a great post. I love learning new things about nature and animals. Like the others, I have never heard of this bird either, how exciting, what a great capture. Nice bird - odd name. Thanks for sharing. I always enjoy, so much, bird photos. These are outstanding. It's such a lovely little bird. Thanks for sharing - we don't seem to have this one in My Muskoka ! Beautiful bird and I love how I always get to see something new on your blog. I really enjoyed this post, Eileen. I learned more and thought the photos captured what this clapper is all about! Great photos, Eileen. Wonderfully captured. And my favourite is the second photo. An excellent informational series. I have read about these birds, but never seen them. Eileen: That is such an unusual bird. Don't think I am familiar with this neat bird. Great shots. It's always exciting to watch a new bird. I don't think I've seen these before, either. Hi Eileen, Thanks for introducing Clapper Rail to me, it is such a wonderful creature. Eileen, Your pictures deserves a round of applause (claps all round) Oh dear, sorry. Chicken size? that's some rail, most of ours are quite small. Nice photos of the rail and its habitat. Those were some pretty good looks at a rail. I assume that Clappers are similar to Virginias in that you don't often get good long looks. I'm so glad you posted these pictures. Someone just told me that we have Rails (although I'm not sure if they are Clapper Rails or not) But I am going to go looking soon. What a neat experience! I didn't realize there are Clapper Rails in Delaware. I thought they were West Coast birds! Anyway, congratulations that you were able to take a picture of this shy bird. Good photos! Any time you actually see a rail you are very lucky. Not that hearing one is not great--but they are certainly hard to spot. My favorite place to look for (or listen for)rails is the board walk at South Padre Island. They now have an entry fee, though, and I don't go there so often. I'm happy to see your rail! I cracked up at Magical Mystical Teachers post! Great shots of this elusive bird Eileen. As you say, they are usually heard but not seen. Great sighting. Very cool that you got photos too. He's so unique! I have not seen one, nor heard of one before. From his name I picture him using his wings for clapping, lol.